My little one's school teacher always stands outside the class to receive the kids and wish them, early in the morning. She's always bright, cheerful and turns up looking fresh and presentable. The kids have a big smile on their faces when they see her & we (especially Moms) wonder how she manages to do all this early in the morning. While I will ask her the "secret" one of these days, it has definitely inspired me to look fresh & presentable while dropping my kiddo to school. This simple look hardly takes 5 mins & requires minimum products; but believe me when I say it makes a big difference. 1. I start off with washing my face with a face wash & then apply my normal moisturiser. 2. I top off the moisturiser with a good sunscreen.. it gets bright, sunny & quite humid even at 7.30am here in Mangalore. I use the Lotus Herbals Safe Sun Matte Gel sunscreen with SPF 50. It gives my face a matte look & provides good oil-control. For more coverage, you could also use the Lotus Herbals 3-in-1 Matte Look Tinted Sunblock. 3. 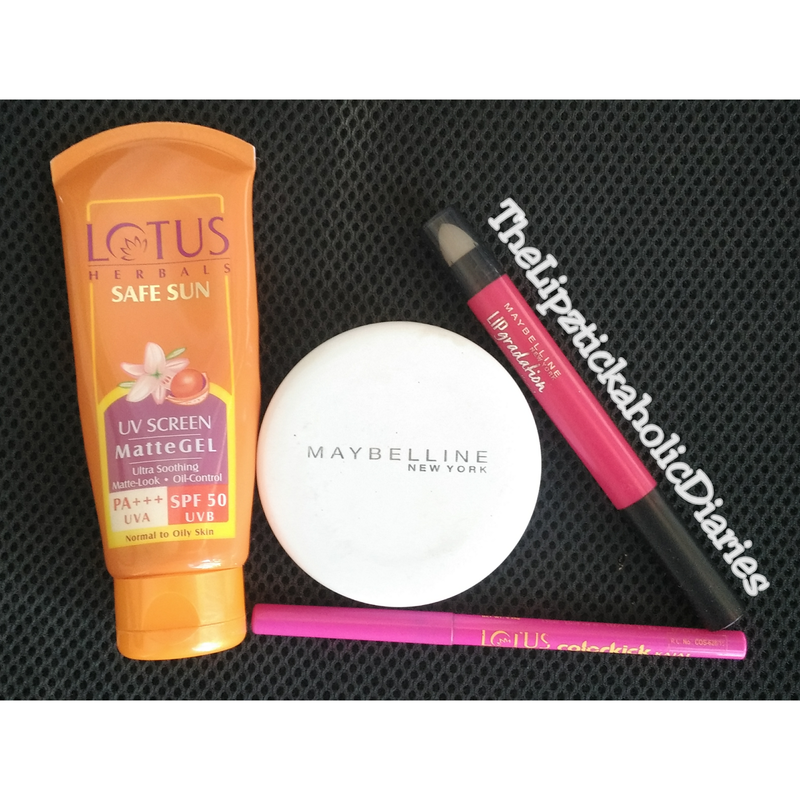 I powder my face with the Maybelline SupraFresh Compact powder. It comes with a mirror & a puff so this step can be done in a jiffy. BTW, this lil guy is great for on-the-go touch-ups too. I use the Chanel Illuminating powder on days when my skin looks dull and needs a perk-me-up. If you're wondering why this "budget product junkie" uses Chanel.. lol It was a gift!! 4. Next step - Kajal.. 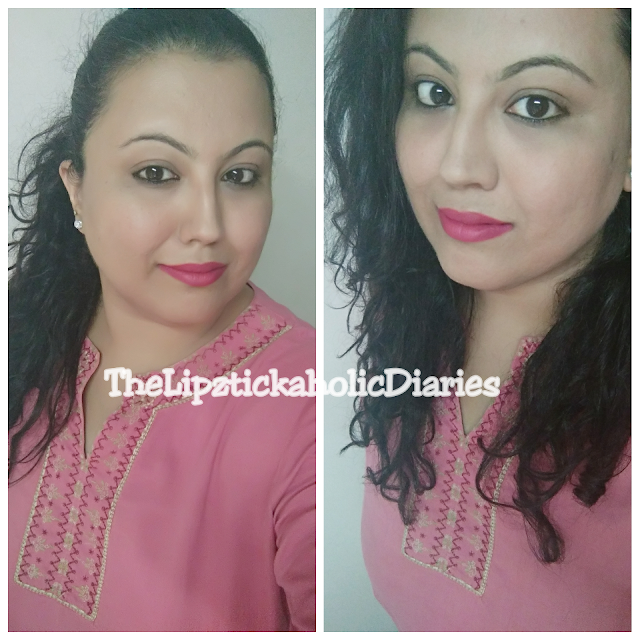 I use the Lotus Herbals ColorKick Kajal (reviewed HERE). I've also been liking the Maybelline Super Black Colossal Kajal. If you aren't a kajal person, you could choose to line the upper lashline. A little something on your eyes, brightens them up & gives your face overall structure & definition. 5. Lastly, apply a lip balm or light lipstick of your choice. Ahem, (cough cough) I'm a "BoldLips" kinda Mommy, so I throw on the brightest shade on most days. Today, I wore the Maybelline Lip Gradation lipstick in shade PINK2. Wearing Lipstick is one step I don't miss out on, even if I the skip the rest. You won't usually find me without lipstick..like anywhere.. lol.. have you noticed the name of the blog? **wink wink**. However, You do You... take these steps & tweak them the way you want. So that's it! That's the 4-product routine ... With my kiddo already ready for school, this simple routine takes just about 3 - 4 mins & we're out of the house!! While some have judged me, most of the Moms have been really sweet & nice. They have come up to me & complimented my lipstick or asked me how I look so "awake". Some have told me they have a bunch of hardly-used products & asked if I could show them to use them. See? **GirlLove** again!!! Hope you liked this post. Would you like to see more such "Mommy-related" posts? Let me know in the comments section below.